Haakon's mother, Queen Sonja, wore the family's magnificent suite of emeralds with a bright green gown. She also wore the Order of St. Olav and King Harald's family order. The groom's sister, Princess Märtha Louise, wore the tiara given to her by her grandfather, King Olav. She also wore an ... interesting set of jewelry, including a necklace, a bracelet, and earrings, that look to be set with topazes or aquamarines. You can also spot a small diamond brooch, the Order of St. Olav, and her father's family order. I'm not sure about the ring -- it's not her engagement ring, as she and Ari didn't make their engagement official until that December. Princess Astrid, King Harald's sister and Crown Prince Haakon's godmother,wore the gorgeous suite of turquoise and diamond jewelry that belonged to Queen Alexandra of the United Kingdom, her great-grandmother. She's also wearing the Order of St. Olav and three family orders: those of her grandfather (King Haakon VII), her father, (King Olav V), and her brother (King Harald V). Without a doubt, the most adorable Norwegian guest at the wedding was Mette-Marit's son, Marius. Look at his little suit! How many four-year-olds get to wear white tie and tails? Queen Silvia of Sweden dazzled in diamonds, including Queen Sofia's Tiara, the Carl Johan Earrings, a diamond collet necklace with a pendant, diamond bracelets, and a large diamond brooch. She's also wearing the Order of St. Olav and the family order of her husband, King Carl XVI Gustaf of Sweden (who is also Crown Prince Haakon's godfather). Crown Princess Victoria made an early appearance in what has become her signature tiara, the Baden Fringe. She's also wearing the small diamond earrings made from Queen Josefina's diamond stomacher, a diamond and pearl brooch, the Order of St. Olav, and her father's family order. Princess Madeleine wore the Modern Fringe Tiara to the wedding. (It's the same piece that she wore at her wedding, but she couldn't have known that then -- her wedding day was still more than eleven years in the future.) She's also wearing simple diamond stud earrings, the Bernadotte diamond bow brooch, and a diamond necklace. She didn't yet have a Norwegian order in 2001, so she's wearing the Order of the Seraphim, plus her father's family order. Also representing the Swedes: Prince Carl Philip, who escorted his sisters. Like Madeleine, he's wearing the Order of the Seraphim. Queen Margrethe II of Denmark (another of Crown Prince Haakon's godparents) wore the appropriately heart-shaped Baden Palmette Tiara to the wedding, pairing it with a diamond riviere and a pair of over-the-top diamond floral earrings. She's also wearing the Order of St. Olav, the badge of the Order of the Dannebrog, and her father's family order. No Mary yet at this wedding -- but Crown Prince Frederik was the best man! He's wearing the Order of St. Olav. Princess Benedikte, Margrethe's younger sister, wore a tiara she had just inherited from her late mother: Queen Sofia's Star and Pearl Tiara. She paired it with a diamond necklace that was made from a sautoir that belonged to Queen Alexandrine, plus Queen Ingrid's diamond fan earrings and star brooches that belonged to Queen Victoria of Sweden. She's also wearing the Order of St. Olav. Benedikte's elder daughter, Princess Alexandra of Sayn-Wittgenstein-Berleburg, borrowed her mother's Floral Birthday Tiara for the wedding. She also wore an elaborate choker necklace of seed pearls. 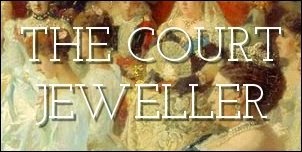 Bjarne Steen Jensen, author of a book on Danish jewels, states that the piece was one of Queen Ingrid's christening gifts, given to her by her Swedish grandparents, King Gustaf V and Queen Victoria. Queen Margrethe's youngest sister, Queen Anne-Marie of Greece, also wore a piece of Ingrid's jewelry at the wedding: the Khedive of Egypt Tiara, which belonged to Ingrid's mother, Crown Princess Margareta of Sweden. (The piece is now the wedding tiara for Ingrid's female descendants.) Anne-Marie is also wearing an aquamarine pendant that belonged to Margareta, plus a square aquamarine and diamond brooch that was a gift from a Greek shipping magnate. The diamond bracelets on her right wrist are a part of the convertible necklace made from Queen Alexandrine's sautoir. She's also wearing her highest Greek order, the Order of the Redeemer. Anne-Marie's elder daughter, Princess Alexia of Greece and Denmark, wore her diamond tiara at the wedding. She also wore the same small diamond earrings that she wore at her wedding, plus a brooch with a small pendant drop and the Order of the Redeemer. Anne-Marie's second son, Prince Nikolaos, also attended the wedding. Like his mother and sister, he's wearing the Order of the Redeemer. The Brits sent three representatives to Haakon's wedding -- though curiously, his British godmother, Princess Anne, didn't attend. Prince Charles came alone (though Haakon and Mette-Marit returned the favor four years later, as some of the only European royals to attend his wedding to Camilla). Charles is wearing the Order of St. Olav. The other Windsors at the wedding were the Earl and Countess of Wessex. Sophie wore her wedding tiara, diamond earrings, and the pearl and diamond necklace given to her by Edward as a first anniversary present. Queen Paola of Belgium wore Queen Elisabeth's Art Deco Bandeau, plus her diamond half-moon earrings, her convertible diamond necklace, a crescent-shaped brooch, and the Order of St. Olav. The Duke of Brabant -- now King Philippe of the Belgians -- attended the wedding without his wife, Mathilde, who was expecting their first child, Princess Elisabeth (now the Duchess of Brabant). Philippe is wearing his highest Belgian order, the Order of Leopold. Grand Duchess Maria Teresa of Luxembourg wore the Chaumet Pearl Choker Tiara to the wedding, plus an enormous double-stranded diamond necklace, diamond bracelets, diamond and pearl earrings, and the Order of St. Olav. To solve the problem of a modest tiara for a princess-to-be, Máxima Zorreguieta Cerruti (now Queen Máxima of the Netherlands) wore the base of the Antique Pearl Tiara without its upright pearls. She's also wearing earrings and a brooch set with diamonds and gray pearls. She also wore diamond bracelets and her engagement ring. Willem-Alexander's brother, Prince Constantijn (wearing the Order of the Netherlands Lion), attended the wedding with his wife, Princess Laurentien. She wore the family's Ears of Wheat Tiara, made of brooches that date to the beginning of the 19th century. No Monegasque princesses at this wedding, unfortunately, but Prince Albert II attended, wearing the Order of Saint-Charles. ... his girlfriend, the statuesque Norwegian model Eva Sannum. Their relationship ended a few months later, and he met Letizia the following year. Which jewels from this royal wedding are your favorites?